The Democratic Party’s latest flavor of the week, Pete Buttigieg, shocked Meet the Press viewers when he openly called himself a “capitalist” during his interview. Like so many others, Buttigieg announced in January that he would be launching an exploratory committee as a potential Democratic candidate in the 2020 presidential race. However, calling himself a capitalist at a time when the left considers this to be an “evil” ideology might not go over so well with Democratic voters. But Buttigieg toes a very strange line. The openly gay millennial candidate is younger and “cooler” than his counterparts and has gone after issues that most Democrats never touch, like the national debt. But while he tries to present his policy stances in a light more appealing to moderate Democrats, at the end of the day his views are not all that different than those of other candidates like Elizabeth Warren and Bernie Sanders. Despite what he may say, Buttigieg’s ideas are antithetical to free market capitalism. In fact, when pressed further during his interview, Buttigieg went so far as to say democracy should not be sacrificed for the sake of a free-market economy. And in making this comment, he has shown that his understanding of both democracy and capitalism are limited and misguided. When it comes to issues of economics, Buttigieg (pronounced Buddha-judge) is just like most of the other candidates in his party in that he is in favor of single-payer health care and labor unions. According to isidewith, a site that keeps track of the different policy positions of various candidates and politicians, he is also in favor of raising the minimum wage, raising taxes on the wealthy, and raising corporate tax rates. What is extraordinary is to do massive tax cuts for the wealthiest, blowing up the debt in the context of an economic recovery where you didn’t need that stimulus in the first place and no one was even asking for it. This kind of rhetoric is really no different than what we hear from others in the party, like Warren and Alexandria Ocasio-Cortez. When it comes to college, he would like to expand Pell Grants to students to make college more affordable. However, unlike Sanders, Buttigieg stops short of calling for free college, which, to be fair, is a pretty genius way to separate himself from the likes of Sanders and other democratic socialists while still catering to a progressive audience by promising to make college more affordable at the taxpayer’s expense. One of Buttigieg’s biggest issues is regulatory capture. For those unfamiliar with the phrase, it is considered to be a type of government failure that occurs when regulators and the commercial market entities they are regulating end up working in cahoots to pass laws that mutually benefit one another. Of course, rather than blaming an overzealous government and overregulation for this “phenomenon,” Buttigieg is more concerned with corporations having too much power. When you have the kind of regulatory capture where powerful corporations are able to arrange the rules for their benefit, that’s not real capitalism. The true solution to this problem is fewer regulations and thus, fewer protections given to powerful corporations looking to get in bed with the government for their own advantage. Without these state-granted privileges, all market entities would have to compete fairly for consumers. Since none of these economic stances are really aligned with true capitalism, audiences were shocked to hear Buttigieg call himself a capitalist on Meet the Press. When Chuck Todd asked the 37-year-old mayor of South Bend, Indiana, point blank if he was a capitalist, his response was “Sure, yeah.” Initially, this seemed like a rather bold statement for a potential Democratic candidate to make since anything short of a blatant denouncement of free enterprise is considered an endorsement for the Republican Party these days. But wait, there’s more. It’s got to be democratic capitalism. And that part’s really important, and it’s slipping away from us. In other words, when capitalism comes into tension with democracy, which is more important to you? I believe democracy is more important. Favoring democracy over capitalism should scare anyone who believes in private property or individual rights. Today, the word “democratic” has become a magical “cure-all” adjective that, when placed before another term, suddenly makes it less threatening. Regular socialism may be terrible, we are told, but democratic socialism, according to the likes of AOC and Bernie Sanders, is different. Democratic socialism, it is said, will never lead to the same economic and social disasters that have occurred in places like Venezuela since “democratic” somehow implies that this system is controlled by a government that is subject to the “will of the people” and thus protected against overreach and abuse. 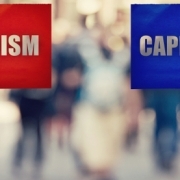 Similarly, democratic capitalism calms the fears of those normally opposed to capitalism, promising to rein in the market by placing the economy under the control of a democratic state. But a market controlled by a state apparatus is closer to economic fascism than capitalism, no matter how much Buttigieg would like to believe otherwise. That sort of controlled economy is essentially what we have now. And what we have at present is an economy being strangled by state intervention and regulation. Yet Americans, Buttigieg included, continue their love affair with the word democracy, even if few actually understand it. Democracy is not freedom. Democracy is two wolves and a lamb voting on what to eat for lunch. Freedom comes from the recognition of certain rights which may not be taken, not even by a 99% vote. Simkin is absolutely correct, and the rights he speaks of are, of course, individual rights. James Madison famously said, “Where a majority are united by a common sentiment, and have an opportunity, the rights of the minor party become insecure.” And there is no minority smaller than the individual. Furthermore, recognizing that democracy is not all sunshine and rainbows like many assume it is, it becomes ever more clear that capitalism and democracy do not actually go hand in hand at all. 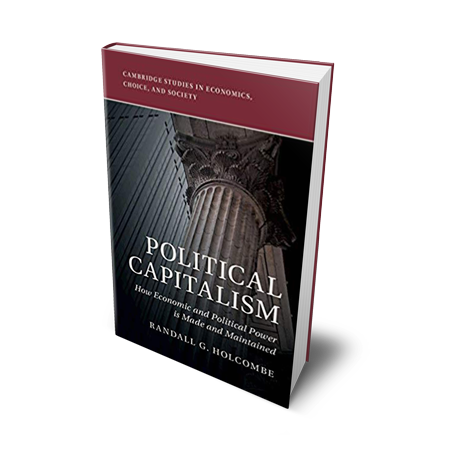 There are inherent tensions between democracy and a free-market economy that make it difficult to maintain a stable system. In particular, the ascendancy of democracy threatens the survival of the free-market economy, which was built on a foundation of liberty. . . . The evolution of democracy has come at the expense of liberty. An essential component of free-market capitalism is an extremely limited government that protects individual rights and stays out of the marketplace in order to let producers properly meet the needs of their consumers. Democracy, unfortunately, does nothing to limit the government’s power in this manner, or at all for that matter. Democracy, however, makes no promises regarding the size and scope of government. Indeed, it could be argued that democracy is inherently hostile to limited government since many citizens in a democracy (including many so-called “capitalists”) soon find they can successfully lobby government officials for subsidies, trade protection, and other legal privileges. Likewise, elected officials soon learn it is in their interest to strategically grant economic favors for their own political and electoral needs. Oddly enough, the same reasons Buttigieg is opposed to an unbridled free market sound very similar to Foulke’s explanation as to why democracy is naturally at odds with capitalism. This, of course, is among the many reasons America’s Founding Fathers feared the raw power of unrestrained democracy. Just like Bernie Sanders uses the term “democratic socialism” to downplay the horrors of socialism, so is Buttigieg using “democratic capitalism” to appear more moderate among the radical Democratic candidates. But there is danger in using this term. Truthfully, capitalism and democracy do not go together at all. And as Buttigieg himself admits, if made to choose between democracy or capitalism, it would be the former. A true believer in individual rights and private property would never sacrifice the free market to the will of the majority.